Kent Referees Society Junior Development Squad Referee, Ben Wood began his refereeing here in Kent after completing an RFU Rugby Referee Award Course. 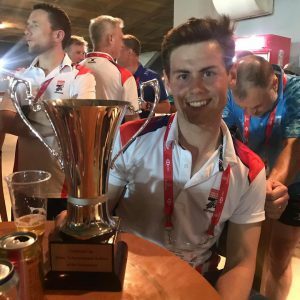 After completing the course Ben joined Kent Referees Society and become one of the members of the Society’s Junior Development Squad. Being part of this squad provided Ben with the support of a coach and a mentor. Ben showed that he was quick to learn and showed maturity and excellent communication skills beyond his years to hold his own refereeing the Senior game. Traveling back and forth from Bristol University and Kent, Ben continues to referee here in Kent and Bristol. Last week Ben had the opportunity, with thanks to a Society sponsor, to referee in Dubai 7’s 2018 tournament to help further develop his refereeing. At the tournament, Ben was awarded ‘Best Development Referee of the Tournament!’ by the officials of Dubai 7’s. Kent Refs are extremely proud of Ben’s achievement.